Looking for modest swimwear? The good news is that there are so many options available these days! 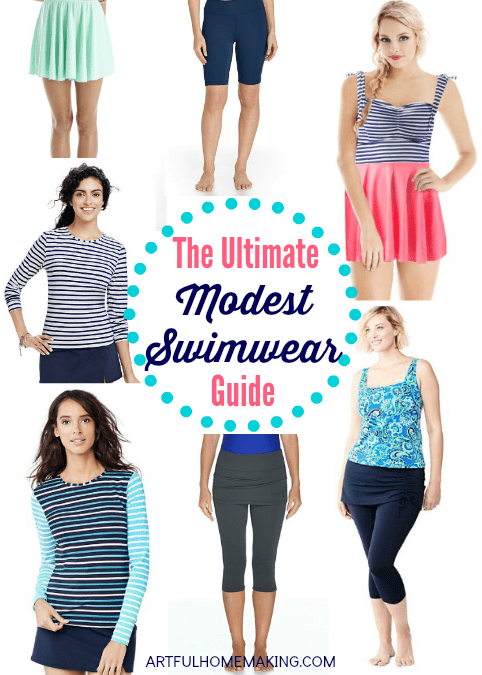 Find something that works for you in the ultimate modest swimwear guide! Every spring, we eagerly anticipate swimming season. It’s one of the highlights of summer for our family. Swimwear for the boys is easy, but it seems like I’m often doing a Google search for “modest swimwear” for the girls in our home. 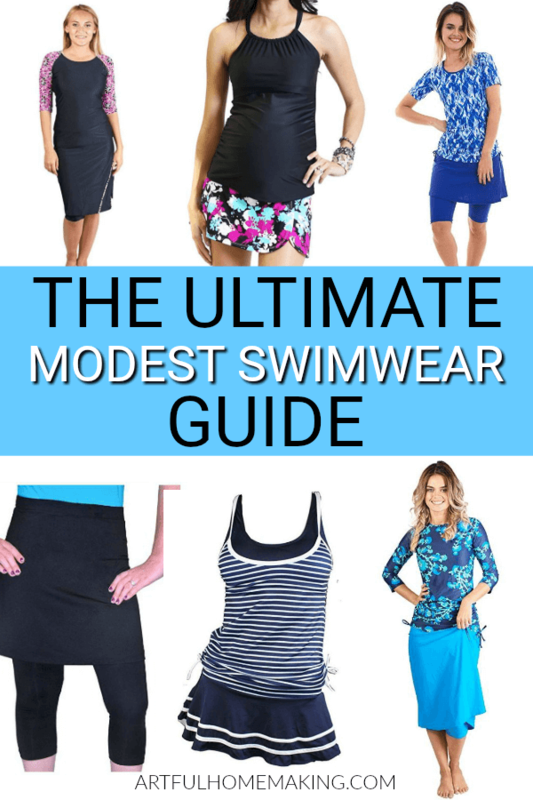 After doing just such a search earlier this spring, I decided to simplify things and create this Ultimate Modest Swimwear Guide so that all of my search results would be in one place as a helpful resource. Because modesty standards vary from family to family, I’ve included a broad range of styles in this guide. Some families prefer sleeves and long leggings and skirts on their swimwear, and you’ll find sources for those here. And I’ve also included sleeveless options for those who prefer that. I’ve tried to include options for everyone! Some of the swimwear options I’ve included can be made more modest by adding a swim skirt, leggings, or board shorts. You’ll also find ideas for altering ready-made suits to be more modest, and a list of patterns to sew your own. Lime Ricki sells some higher-neckline tankini tops, rash guard tops, and also a very cute ruffled swim skirt. Olivia from Fresh Modesty shows how she makes Lime Ricki swimwear even more modest with leggings and a top under the tankini top. And here’s another example from Olivia. Rey Swimwear offers some very feminine suits with a vintage feel. 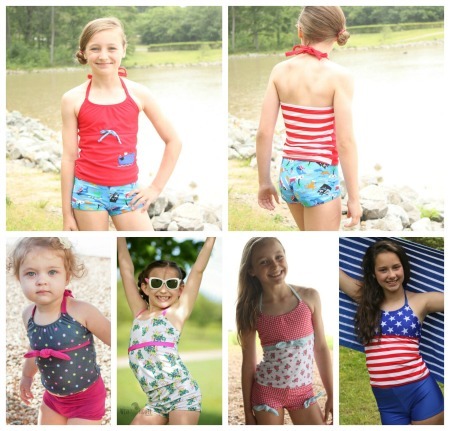 I love the fabrics they use, and their swim skirts are adorable. Under Cover Waterwear sells a variety of modest swimwear. From a-line swim skirts to rash guards, to leggings, they’ve got you covered. 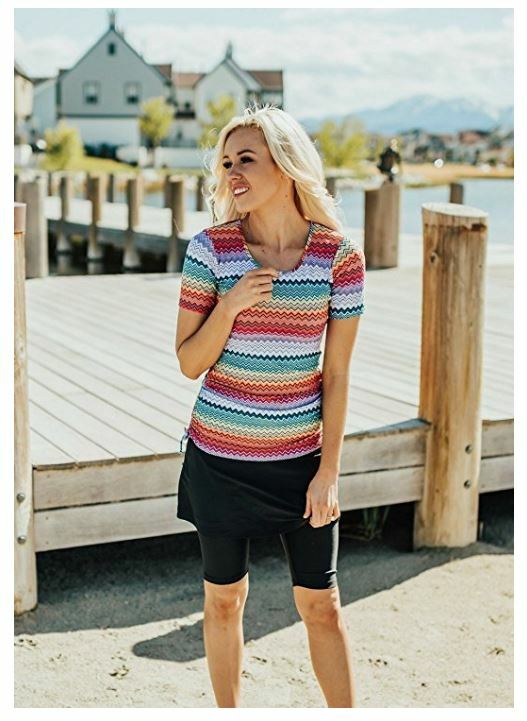 They also have a Lifeguard Skirt with attached shorts underneath, which would be so practical and modest at the same time. 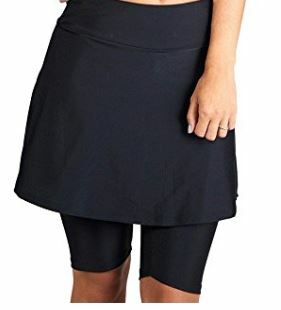 Coolibar has some great options, like their rash guards, swimming shorts, skirted swim shorts, and skirted swim capris. Girls 4 Sport sells rash guards and extra-long board shorts. Aqua Modesta features swim skirts and rash guards. Lands’ End has a huge selection of cute rash guards. I bought one of these last year after getting the worst sunburn of my life from a day spent at the lake! These are a great option if you prefer your legs to be covered. L.L. 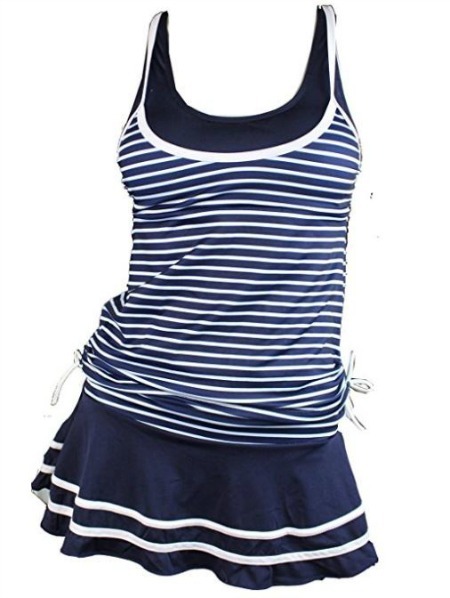 Bean offers board shorts, swim skirts, and tankini tops with a more modest neckline. They also have some modest options for girls. HydroChic has lots of modest swimwear options. I especially like their skirted swim capris. 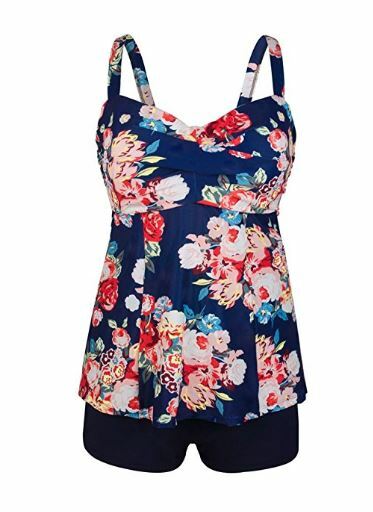 Woman Within has quite a few modest options in plus sizes, including higher-neckline tankini tops, swim skirts, board shorts, etc. This is such a great idea! Jennifer modifies board shorts to turn them into boardskirts—feminine swimwear for girls and ladies sizes 18 months to 3XL. See what’s in stock here. Did you know you can find a modest swimsuit on Amazon? The awesome thing about ordering from Amazon is that you can often get free shipping and returns are easy! This Etsy shop has cute swimwear options for both girls and ladies. 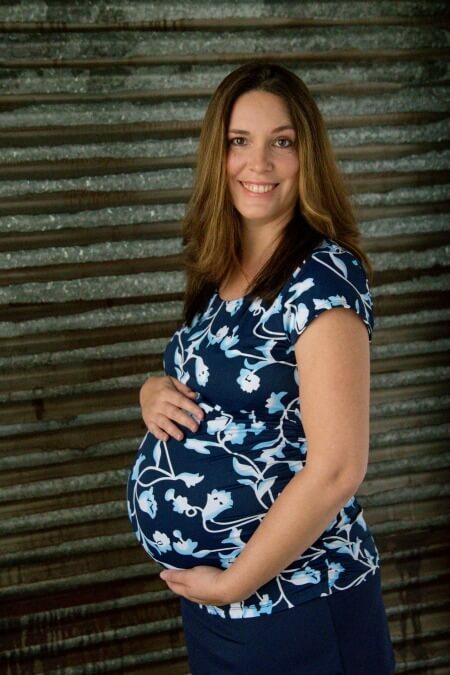 The owner of this Etsy shop has some items listed that are ready to ship, and she also offers custom-made suits, including maternity and nursing options! If you’re interested in sewing your own modest swimsuit, here are the modest swimwear patterns I found. 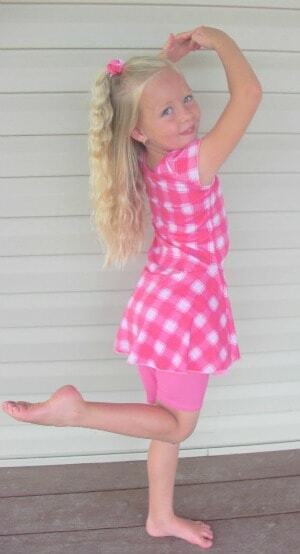 My Childhood Treasures offers this very cute leotard/swimsuit pattern that comes with an option for an attached skirt. You could customize this in so many ways! This was the first time I had ever sewn swimwear before! 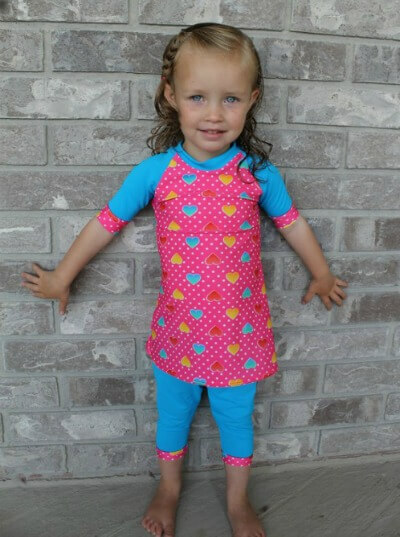 This Tutu Cute Swimsuit pattern by Peek-a-Book Pattern Shop is adorable! You could also make the tutu skirt longer if you wanted. It’s sized 3 months to 12 years! This isn’t a swimsuit, but it’s such a cute cover up tutorial that I had to include it! This is the swimsuit I found at the Dollar Store and modified last year to make it more modest. Some of the links in this post are affiliate links. Read my full disclosure here. Sharing here. Thank you! This is really fun to have all these options in one place. Delete if this is not permitted but I started a modest swimwear shop on etsy. It’s not big by any stretch of the imagination, but what could I do to get it listed with your list of modest swimwear? I loved this post today and I’m so glad I found you thanks to the #breakingthru linkup. 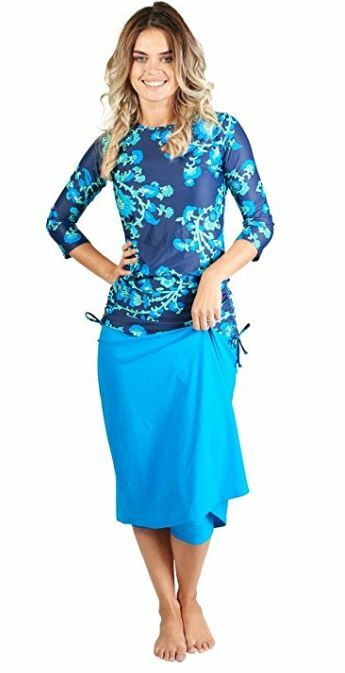 I had been searching for years for a modest bathing suit that I felt was attractive and was struggling through the changing fashion trends and cost. I found mine this year through Athleta which not only has rash guards but also has some great tankinis. Mine has a lovely higher neck and great support for a large chested woman. 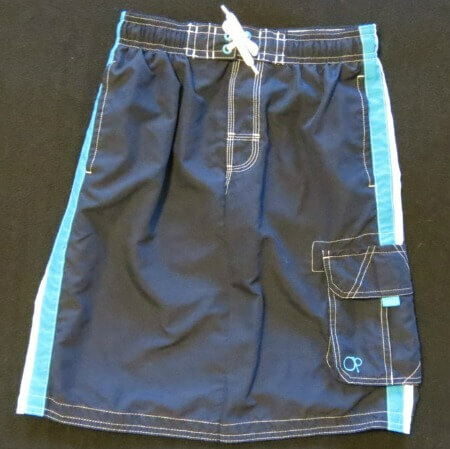 I also got the board shorts swim trunks from them and I felt comfortable and attractive without showing all my bits. It was disturbing to see the level of skin most people are comfortable with. So glad it was helpful! Thanks for sharing where you found yours! This is a wonderful resource! My girls and I always have a hard time find a modest swimsuit. I’m sharing this! Thank you! Thanks, Whitney! Glad it was helpful! Thanks so much for sharing this! I’m going to pin it to come back to later when I need to find some swimwear. I’ve been wearing t-shirts and shorts over bathing suits for years, both for modesty and to protect my super-fair skin from the sun, but I never loved how I felt or looked all layered up like that. I’m so glad to see so many companies are creating swimwear that is modest but also cute! Glad it was helpful, Sarah! I agree, it’s so encouraging to see all the cute and modest swimwear available these days! This is an amazing list! 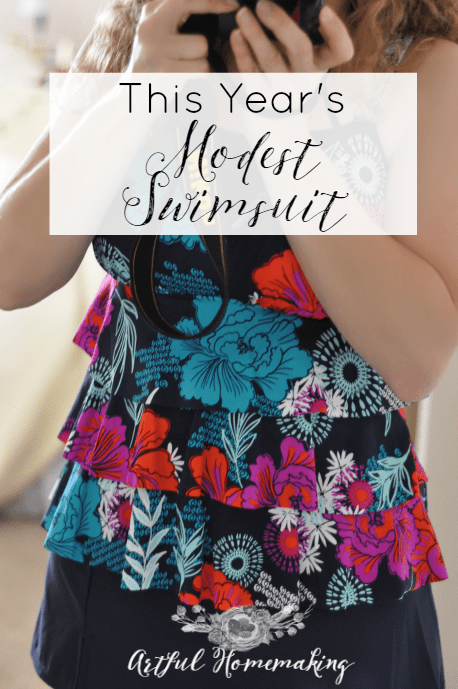 From personal experience, I found Modli to be the best website to buy modest swimwear. They sell so many different styles and they have a great variety of modesty. They do have some great choices! Oh, I loved this post! Such stunning modest swimwear! Last year I was so upset…I couldn NOT find a costume that would allow me to swim comfortably and still be modest… Then one day I was working on my Etsy shop and the Lord directed my eye to Cover up for Christ! Wow! I was amazed and so delighted! When I saw that Bree didn’t normally ship to South Africa, I sent her a message and asked if she would make an exception… She was SO wonderful and my costume arrived swiftly and fitted beautifully… That was the other thing that prevented me from finding just the right costume – I don’t fit a ‘one size fits all’ and Bree custom made it for me, praise the Lord! This season I enjoyed every moment swimming and never once felt uncomfortable or even odd for my very different costume – it is both beautiful and practical! So thankful to the Lord! Great resources! I’m swimsuit shopping with my 12-year-old right now, so this is helpful. So glad it’s helpful, Jenny! Thanks for stopping by! I love my bathing suit from Land’s End, I highly recommend their swimwear. They are a little bit more pricey, but a great quality, I’ve had mine for three years now. For plus ladies, Woman Within had a GREAT modest selection this year. Swim tees and tasks (not fitted like land’s end), swim skorts, lots of swim dresses and skirts, high neck suits. I was thrilled!!! In years past KMart had a great modest selection, too (though I haven’t looked there recently). I just took a look at Woman Within, and you’re right, they do have some great modest options this year! I’ll add them to the post. Thanks so much for sharing! Divita Sole, Downeast Basics,Jen Clothing are some other sites that carry some decent tankinis. Thanks for mentioning those sites—I’ll add them to the post! I have seen a lot of these, but I feel I like I always need something or something just does not quite work. I have a tankini with a skirt know, but I was holding down my top and skirt a lot. In your top photo collage, what is the source for the middle shorts on top? Those short are perfect. Wow, they come in grey too. Those are really nice. I think I want (when I can afford it) a Rey top, skirt, and those pants, and I think I would feel cute and comfortable. It really has to be both for me or I won’t swim. Thanks so much for gathering all these resources!! I’ll be pinning this to refer to in the future! You’re welcome, Tracey! And thanks so much for pinning! I love Becca’s ruched top! So classic and lovely. I know, isn’t it great how many modest things are available now? It’s truly encouraging. Blessings to you, friend!